Stamina Conservation: You'll lose about half as much stamina when using tools in Seedling Mode. For example, tiling a field using a basic-level Hoe uses 20 stamina in Veteran Mode and 10 stamina in Seedling Mode. Shop Discount: The costs for goods at the village shops are 30% less expensive in Seedling Mode than Veteran Mode. A cow costs 3500 G in Seedling and 5000 G in Veteran. Farm Circles and other improvements from Ludus' shop require the same amount of materials in either mode, yet the amount of money you'll need to pay him for construction will be less. The mode you choose will not affect the amount of money you need to supply when taking part in an applicable Town Rank challenge. You can't change your gameplay mode once you have started and saved your game. If you chose to play in Seedling Mode, a small green sprout will be next to your character portrait on the game's Save/Load screen. Nothing special will appear on the save game file of a Veteran Mode player. The game supports two save files. After you select your game mode you'll pick your farmer's gender. You can play as either a boy or a girl, which locks you to the opposite gender marriage candidates. Boy farmers can marry Iluka, Lisette, Kasumi, Komari, Siluka, and Stephanie. Girl farmers can marry Ford, Hinata, Ludus, Wayne, Woofio, and Yuzuki. Both genders can marry the magical deity, Inari. You can customize your character so it visually appears like any gender you prefer, but during the wedding your character will wear the gender-specific clothing. Next you'll pick your character visual options: skin tone, face style, eye color, and hair color. ALL of these options can change later in the game. Witchie's magic can change your skin tone, face style, and eye color. The stylist outdoor stall in Tsuyukusa can change your hair style and hair color. The hair shop unlocks after you upgrade your house for the first time. You can remove the default hat from your character once you upgrade your farm house and unlock the Clothing Closet. This will happen after Spring 12 of your first year. On your birthday the villagers will give you presents when you talk to them. It is okay if your birthday falls on the same day as a festival; just talk to the villagers either before the festival or after the festival takes place. It is also okay if your birthday is on the same day as another villager's birthday. 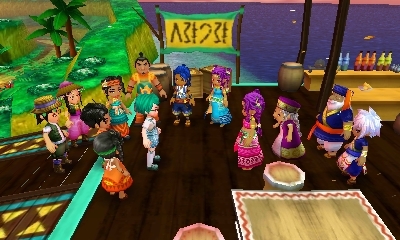 Once you reach Rank C or higher with each of the villages, walking into certain areas on your birthday between 13:00 and 17:00 will trigger a surprise party with all of the town's villagers. For Westown you will walk into the Garden Grill, for Tsuyukusa it is at Tea-ful Reunion, and for Lulukoko it is just walking into Lulukoko (South). The town that holds the birthday party will rotate annually. Westown is in year 1, Tsuyukusa is year 2, Lulukoko is year 3, Westown is year 4, and so on. The birthday surprise party won't trigger if a storm happens to occur on your special day. If you are going-steady with a marriage candidate or you are married, another birthday celebration will take place inside your farm house. Walk into your house between 19:00 and 24:00 when you have empty space in your bag to trigger a special evening meal with your sweetie. You will receive a flower bouquet or perfume and +1000 Friendship Points with your beloved. Your character's name will be limited to a maximum of 6 characters in length. You CAN change your name later by pressing the A Button when facing the bookshelf inside of your farm house and then press the X Button to bring up the change options. You can change your name and your farm's name. 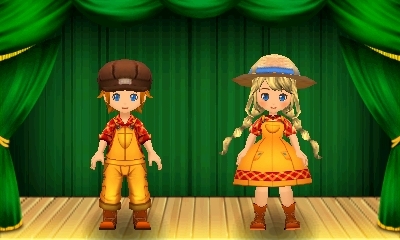 The names set for your character and farm are displayed to other farmers when you are using Connectivity Island via the Nintendo Network or you have enabled a pet to be your Street Pass avatar. The personality of your character will give you a small starting bonus. There are a variety of types that you can choose from. The character's personality cannot be changed once you confirm your character options, and is no indication as to how you are expected to play your game. Simply pick the personality type that will benefit you the most. Animal Lover: When you obtain a new animal or pet for your farm, whether born or bought, the animal will start with one heart of friendship. Fisher: The fish you catch will have a higher Star Rank because you'll have a higher starting fishing level. Sports Enthusiast: You will start the game with six stamina hearts instead of the default five hearts. You can never get more than 10 stamina hearts in the game, no matter how many you start with. Tycoon: Your farming adventure will start with 50,000 G instead of 4000 G (2000 G when Frank delivers your tools, and 2000 G when Frank explains animals). Charmer: Each person you initially meet will have bonus friendship with you. Marriage candidate will start with a base of 10,000 Friendship Points (1 heart), and each normal villager will have 5000 FP (1 half heart). You can see your friendship levels by using the bookshelf inside your farm house. Layabout (Weakling): For a greater challenge, selecting this personality type will reduce your staring stamina hearts to two, with seven hearts as the maximum amount of stamina you can have. Miracle Worker: This personality will use the save data from your currently saved game and carry parts of it to your new game. The continued-on features will be the number of stamina hearts you have, your money, the cooking recipes you know, your clothing closet items, the trophies tied to your cooking level and outfit collecting, and your farm degree level. The saved game you pull your data from WILL NOT BE ERASED unless you intentionally overwrite the old save with your new game. The clothing items and cooking recipes that carry over from the Miracle Worker choice won't be available to use in your new save file until after you remodel your original run-down farm house to unlock the closet and kitchen. The festival prizes in your new game will still be awarded in sequential order, even if you already own the clothing or kitchen recipe.